Rescuers Struggling To Reach Areas Of China Hit By Quake : The Two-Way More than 180 people reportedly have died following Saturday's strong temblor in Sichuan province. Aftershocks and landslides are making difficult to get to the villages and other places that were hit hard. As rocks and dirt tumble down a mountainside (at left), a police officer urges people to stay back on a road in Baoxing county, Sichuan province, on Monday. Rescuers are having a hard time getting to victims of Saturday's strong earthquake because of aftershocks and landslides. Reaching the victims of Saturday's strong earthquake in China's Sichuan province remains difficult because of aftershocks and landslides. "Xinhua news agency says the first team of rescue workers arrived in Baoxing [county] Monday. 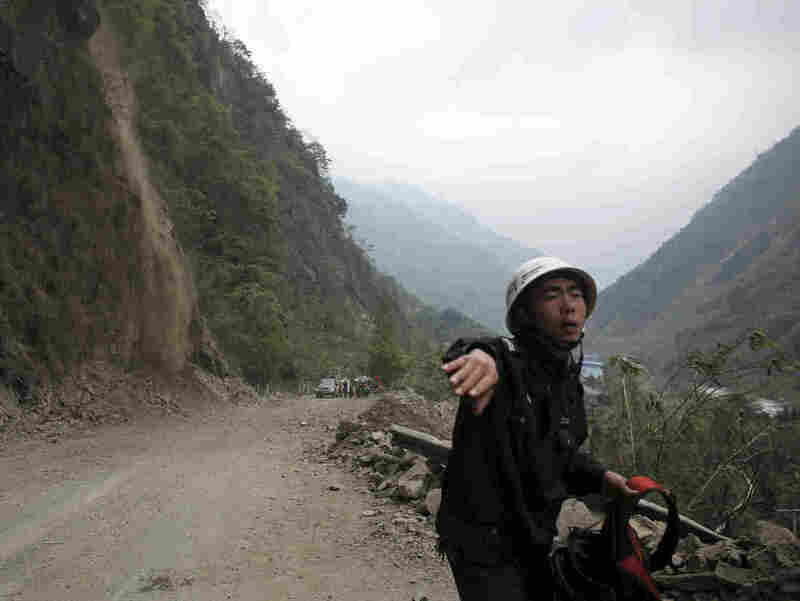 Authorities say the road was cut off by an aftershock-triggered landslide. State media say hard-hit parts of Lushan county were also not reachable by road, with phone services cut off. But rescuers have since dynamited highways to clear landslide debris, allowing heavy equipment to reach affected areas, and electricity and phone services have been restored to thousands of people." More than 180 people are reported to have been killed in building collapses and other problems created by the worst quake to hit China in the past three years. According to the BBC, "correspondents say the hill villages, where farmers grow rice, vegetables and corn on terraced plots, were hit the hardest by the earthquake." Thankfully, the toll is far less than the estimated 90,000 deaths in 2008 after an even stronger temblor hit the same region.